As part of the Anderson Center exhibit the Upper Mississippi River Project many of the works in the show have corresponding QR codes that lead to supporting images or videos. 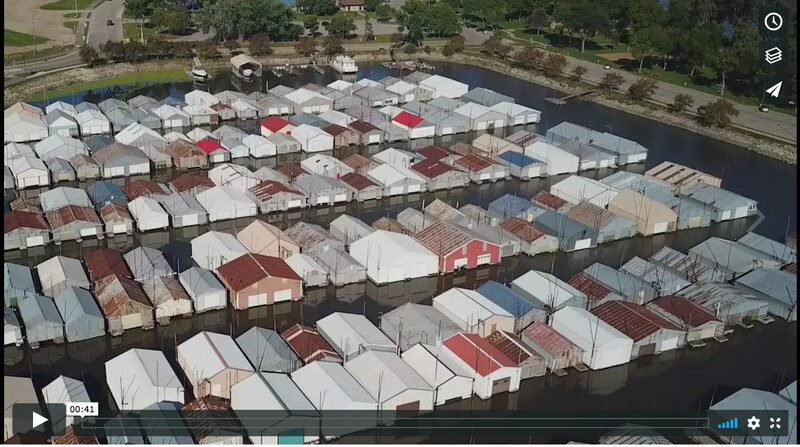 Here is direct link to the video of the boat house in Vogel Harbor. The link is on the floor next to a three foot round fisheye image of the harbor. Select the image to view the video on Vimeo. Minnesota photographer Chris Faust provides a one minute overview of the Upper Mississippi River Project photo exhibit at the Anderson Center in Red Wing MN. The Anderson Center exhibit of the Upper Mississippi River Project contains two 3X12 foot panorama photographs mounted to windows. Here are two detail photos of the installation. In the full sun they glow like stained glass. Select the images below to see larger versions. Two large scale window images from the Upper Mississippi River Project photography exhibit at the Anderson Center seen in full sun. Select the image to open the video. Use your mouse to navigate the video while it is playing. Here is a 360 degree panorama of a portion of the Anderson Center exhibit.